"Since we are in respectful disagreement with the view taken in Mohan Lal (Supra), this matter may require consideration by a Bench of atleast three Hon'ble Judges." A two judge bench of Supreme Court, yesterday, expressed its disagreement with the view taken by a three-judge bench in Mohan Lal vs. State of Punjab where it held that that the accused is entitled to acquittal if informant and the investigator in NDPS cases is the same person. The bench comprising Justice UU Lalit and Justice MR Shah made this observation while hearing an SLP (Mukesh Singh vs. State) filed against conviction in an NDPS matter. The counsel for the accused placed reliance on MohanLal vs. State of Punjab to contend that since the investigation in the present case was conducted by the Police Officer who himself was the complainant, the trial was vitiated and as such the petitioner-accused is entitled to acquittal. Referring to the said judgment and also taking note of some other judgments on this aspect, the bench said: "We may prima facie express that we find it difficult to accept the view taken in Mohan Lal (Supra). Some of the decided cases have maintained a distinction in that where the investigation was conducted by the informant himself, appropriate weightage was given while appreciating the evidence. 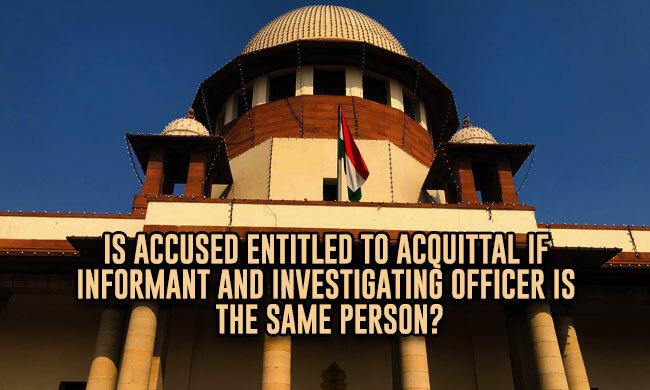 In a given case, where the complainant himself had conducted investigation, such aspect of the matter can certainly be given due weightage while assessing the evidence on record but it would be completely a different thing to say that the trial itself would be vitiated for such infraction. But Mohan Lal (Supra) has ruled that the trial itself would stand vitiated on that count." Observing that this matter require re- consideration by a Bench of at least three Hon'ble Judges, the bench directed the registry to place the papers before the he Chief Justice of India to constitute a Bench of appropriate strength to consider the matter. "The instant matter and the questions raised herein therefore need to be resolved at an early date. ", the bench added. A three-judge bench of Justice Ranjan Gogoi, Justice R Banumathi and Justice Navin Sinha had pronounced the judgment in Mohanlal case. The bench, taking note of conflicting views, had finally held: "It is therefore held that a fair investigation, which is but the very foundation of fair trial, necessarily postulates that the informant and the investigator must not be the same person. Justice must not only be done, but must appear to be done also. Any possibility of bias or a predetermined conclusion has to be excluded. This requirement is all the more imperative in laws carrying a reverse burden of proof." 'If an informant police official in a criminal prosecution, especially when carrying a reverse burden of proof, makes the allegations, is himself asked to investigate, serious doubts will naturally arise with regard to his fairness and impartiality. It is not necessary that bias must actually be proved. It would be illogical to presume and contrary to normal human conduct, that he would himself at the end of the investigation submit a closure report to conclude false implication with all its attendant consequences for the complainant himself. The result of the investigation would therefore be a foregone conclusion,' Justice Navin Sinha observed in the judgment speaking for the bench.